National Armed Forces Day was celebrated at Bloubergstrand in Cape Town on Thursday with a display of the Defence Force‘s military capabilities, state of the art hardware and technology. But more importantly, the day is to honour those who died serving their country. The 21st February was proclaimed Armed Forces Day to observe and commemorate the sinking of the SS Mendi in the English Channel in 1917 during world war one. More than 600 people died, most of them black South African troops. 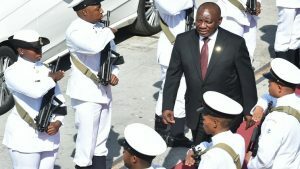 The commander in chief of the SANDF, President Cyril Ramaphosa, handed the ship’s bell to the Defence Force and in turn to the Navy. In his keynote address, Ramaphosa said he would hold discussions with key role players to ensure that a proper memorial will be put in place to honour these men. On Thursday the men and women in service held a display of their powerful capabilities on land, sea and air. Dlamini would not be drawn on the Department of Military Veterans saying it would no longer honour the fallen troops of the SS Mendi as they were involved in an imperial war. The day’s proceedings included a parade through the streets with the the army, air force and navy putting their best foot forward. The post National Armed Forces Day commemorated in C Town appeared first on SABC News – Breaking news, special reports, world, business, sport coverage of all South African current events. Africa's news leader..